It was a perfect evening for the BC Aviation Council’s 2015 Silver Wings Awards ceremony at the Vancouver Convention Centre this week, with a backdrop provided by the North Shore mountains, Vancouver Harbour and a west coast sunset. As the last Harbour Air and Helijet flights of the day arrived and departed, this year’s honourees were piped in before an audience drawn from all corners of the aviation industry. Once again the evening was emceed by Johanne Wagstaffe, CBC meteorologist, pilot, glider pilot and proud air cadet alumnus. There are 11 scholarships awarded to students in various disciplines within the aviation community. Many of the scholarships were established as permanent memorials to pioneers in B.C.’s aviation community while others are supported by a fund established for the purpose by BCAC. Funding for the BCAC scholarships comes from the proceeds of an auction that has become a highlight of the evening and is growing larger with each year. Nathaniel Ralphs, a 17-year-old high school student from Victoria, B.C., was the recipient of this year’s Anderson Family Flight Training Scholarship. The scholarship provides $5,000 to “assist in completing their Private Pilot’s Licence.” The award is actually presented in June, to allow the recipient to put the money to work over the summer. One of the requirements of accepting the scholarship is for the recipient to speak at the Silver Wings award ceremony and give an update on what they have done in pursuing their goals. Ralphs created a very positive impression with his clearly articulated vision of his future. In speaking to the question of how he put the scholarship to work, he brought a chuckle from the crowd when he said that over the past summer he had spent more time at the Victoria Flying Club that he had at home. This year’s Industry Awards were an all-star lineup and truly represented a Who’s Who of not just the B.C. aviation world, but the Canadian aviation world. Entrepreneur of The Year is Wayne Coulson of Coulson Aircrane. Best known for the Martin Mars, Coulson operates tankers and Class 1 helicopters around the world as only one facet of his business. BCAC Environmental Award in Aviation went to Danny Sitnam and Helijet. The largest and longest-running helicopter passenger airline in the world, Helijet takes care to fly its routes in a way that is least disruptive to its neigbhours. It means flying higher and a long, more circuitous route that necessary, but as Sitnam says, they do it not because they have to do it that way, but because it is the right thing to do. 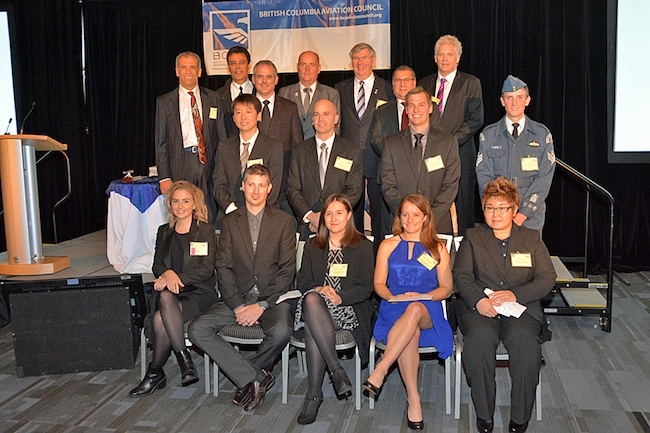 Back & Beck Aviation Air Safety Award, recognizing the most significant contribution to air safety in British Columbia – Bill Yearwood of the Transportation Safety Board.